The beautiful Victorian Shingle style house at 633 south Center Street is a superb example of late Victorian architecture in California. Built around 1887 on two and one half acres, which included a producing orange grove, it was owned by James B. Raynor, a prominent Redlander. 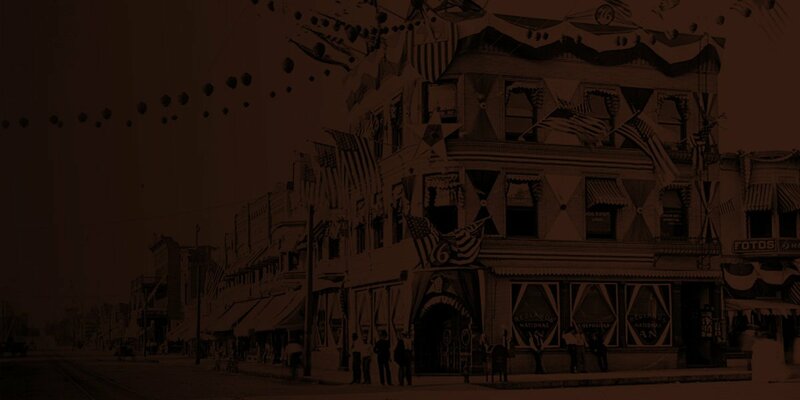 By the early 1890’s, Mr. Raynor had been appointed to the Boards of both the Redlands Street Railway Company and Union Bank of Redlands. It was sold in early 1893 to J.R. Westbrook, and in 1894 the mortgage was purchased by Albert Fletcher Burk and his wife Mary. As was too often the case, people who came to Redlands for their health also died here. Only a few weeks after arriving in Redlands and moving into the house, Mr. Fletcher died of tuberculosis, leaving his widow and son in the house. Interestingly, there was a scheme briefly in the Fall of 1894 which involved another prominent Redlander, E.J. Waite. Mrs. Burk and Mr. Waite traded houses, and Mrs. Burk opened a first class boarding house in Mr. Waite’s house. They soon traded residences again.Around 1902 the property was sold to Mary O. Colson, who subdivided the property into four lots. The property changed hands ten times between 1902 and 1944. An addition to the rear was made in 1908. For several years during the late teens and early 1920’s, the house was actually vacant. It was not until after the Fullers moved in during the 1940’s that the subdivisions were individually sold and the orange grove developed. Beginning in 1946 the Fullers rented out the rear carriage house, 633 ½ Center St. In 1951 the Fullers moved into a new house on one of the subdivided parcels, and a series of residents moved into and out of the house.The house itself is a one and one-half story Victorian Shingle style house. The entire surface of the original house, from the roof line down to the bottom of the foundation, is covered with wood shingles. The house has a steep pitched front gable roof with symmetrical gabled dormers. The facer boards have decorated ends, and the rafters are exposed along the eaves. Above the front porch is a balcony with a stick railing. The porch includes five semi-elliptical arches, with three arches on the front. The front steps lead up to the center arch. The front window is in three sections, with a multi-pane window on the top portion of each. The door is offset to the south, and another small window is located between the door and the south wall.On the north side of the house are two double-hung sash windows east of the porch, in addition to a large polygonal bay window, with four tall double-hung sash windows. The dormers, identical on both the north and south sides, have two double-hung sash windows. The rear, or east side has a large single story addition, which includes a garage. Below the east gable are a plain frieze and two double-hung sash windows.The south face of the house has a square multi-paned window. 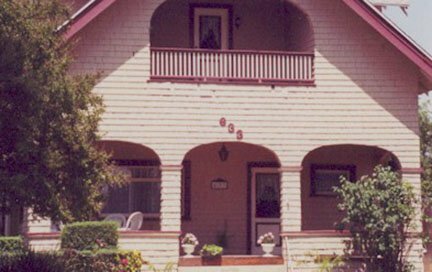 The Redlands Area Historical Society is proud to award this fantastic example of Shingle architecture.